Stephan Lewandowsky, whose field of expertise is supposedly “cognitive psychology”, has a magnificent obsession with denigrating any and all who do not swallow wholesale the tenets and dogma of the so-called “consensus” on global warming, aka climate change. His main claim to fame is a “peer-reviewed paper” that became the source of much amusement in the blogosphere – including this quiet little corner – last September. Lewandowsky’s primary self-promotion bullhorn is a blog that is pompously called “Shaping Tomorrow’s World” (STW) under the illustrious auspices of (inter alia) the University of Western Australia (UWA), Lewandowsky’s now-former “academic” home. Included in a flurry of posts (which he began on Sept. 3) leading up to the “reveal” of a link to his actual (but at that point still not published) paper, was the mind-boggling claim from Lewandowsky that he was owed an apology by (amongst others) Steve McIntyre, because McIntyre (and others) had failed to find a 2010 E-mail invitation from Lewandowsky – that had made absolutely no mention of “Lewandowsky”, and in fact had been sent by his “assistant”, a Charles Hanich. Talk about chutzpah riddled with self-serving “revisionism”! The amusement Lewandowsky’s shoddy so-called 2010 “survey” (which became the centrepiece of his 2012 “paper”) provided to those of us in the skeptic blogosphere sent the poor man (and his side-kicks and acolytes) spinning downwards into a rapid whirl of “recursive fury“. All of the above is by way of background to a curiosity I noticed in a recent post by Steve McIntyre, in which he provides indisputable evidence of Lewandowsky’s “backdating” of a post (which, coincidentally – or not – happened to be Lew’s link “reveal” post I noted above). Shub Niggurath provides a very helpful summary for those who would like the short version of McIntyre’s admirable dissection. On May 9, [2012 Australian Climate Madness‘ Simon] Turnill asked again for “a printout of the web server log or blog database” “or other evidence that shows the ACTUAL time at which the publish button was clicked on each of the posts previously requested”. You state: “the author has to manually enter the publish date and time”. Does this mean that the author can put any date and time on a post, irrespective of when the post actually went live on the server? This does not answer the question. The information I am seeking is the precise time the posts went live on the site. There will be a server log which shows the time at which the individual files were uploaded to the http server, and were therefore available to view on the site. That is the information which I require. The Shaping Tomorrow’s World website is hosted by ilisys.com.au in a shared-host environment. Following your latest email, enquiries were conducted with the Ilisys’s Technical Support department and they confirmed that the database server does not log individual entries. There is no further information available apart from what has already been provided to you. How did he choose this “Category”, eh?! Do all STW bloggers come equipped with down-to-the-second watches?! If this is the “manual” publish date/time “entry” point, for STW bloggers – as UWA appears to contend – all I can say is that one could drive a virtual truckload of potential user errors through it! Given the overloaded kitchen-sink of iconic aids for an apparently mouse-dependent blogger, such as Lewandowsky, I cannot imagine that a user would be required to “manually enter” the date and time of publishing a post – unless s/he wanted to change it! And I can do this whether or not I’m using the “kitchen sink” of visual aids (which, as a keyboarder, most of the time, I don’t). Just like WordPress, whatever “custom designed hand coded” system STW might be using, it depends (as do many) on use of “PHP” – a “scripting” language that magically transforms the blogger’s content into a pretty webpage. Knowing this, I suppose it’s possible that such a unique identifier for each post is not found in the database table containing STW URLs and “date/timestamps”. But it strikes me as being highly unlikely! So my guess would be that if one requested an extract of the all the columns in the server log for each of the posts in question – or perhaps a less “simplified” view of these posts generated by their primitive “custom designed hand coded” system – one would surely find evidence of each post’s “history” – with accompanying server-generated “action” descriptions and date/timestamps. The other interesting thing is UWA’s mention of “ilisys” as their host of choice. This host offers a whole array of features. ← Society of Environmental Journalists … lockstep in an appalling beat of bias? I’ve picked apart the STW html source trying to get some grasp on the “custom designed, hand coded system”. 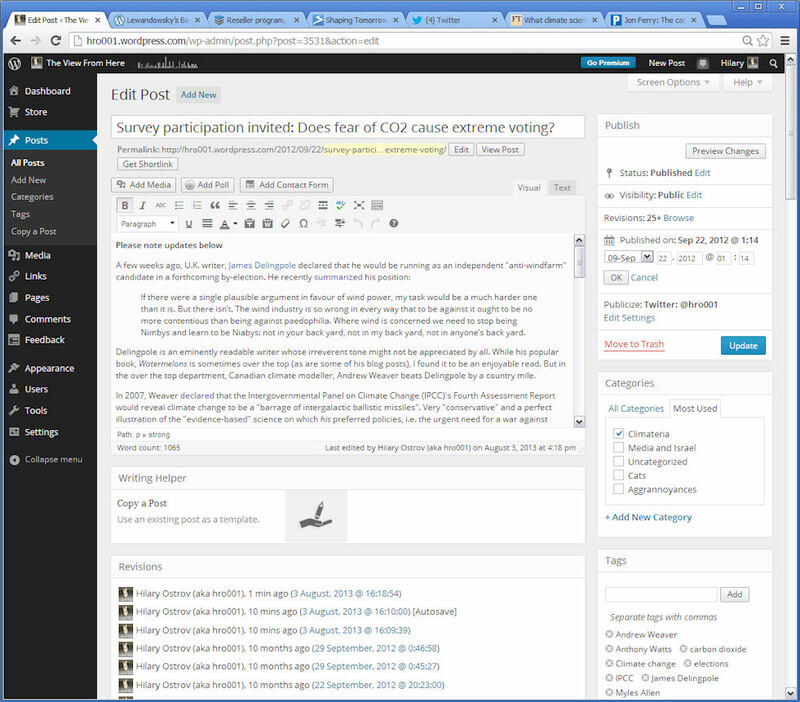 Though there appear to be a few elements of hand coding, the blog editing module is off-the-shelf open source used by many blogs, including WordPress. Example here. IFAIK, there is no option that allows the date and time to be excluded from the CMS. Of course, it can be deleted or edited post-hoc. And, the similarities between STW and Skeptical Science html source are remarkable. UWA FOI Co-ordinator Vittoria Wilkin would have had to confer with someone who is familiar with the “custom designed, hand coded system”. Since the STW blog doesn’t reside on a uwa.edu server, their internal IT people would be of little or no assistance. Who would that person be? I think the designer is John Cook. Did he assist Lewandowsky in how to use post dating techniques? And was he contacted for assistance in fulfilling Simon Turnhill’s FOI request? Hilary: Thanks, Duke. I think I’ve now (finally!) fixed your link, above. “his new website http://www.shapingtomorrowsworld.org is dedicated to discussion of those challenges and potential solutions based on scientific evidence and scholarly analysis. The site was conceived by a team of academics at the University of Western Australia, and it was designed and implemented by Wendy and John Cook of http://www.skepticalscience.com. Heh. Seed funding. Looks like the Cook Design Team essentially ported over the SKS format that was already in existence. Wonder if the grant details ( amount, disbursements, etc.) are FOIable.